Box has just announced a series of updates that revolve around providing a more ‘social’ experience to its users. These updates are clearly aimed at gaining more enterprise customers for Box by enabling more interaction and engagement and making it easier for sharing and collaboration. However, many enterprise customers will value utility over the ‘Facebookisation’ of Box. This is where the new enhanced search functionality, and the ability to edit documents from within the application are potential game-changers. Below is a video detailing these changes. On the whole, Box needs to maintain a fine balance – by incorporating a much-needed social fabric (and the ensuing chaos, privacy concerns, information overload), it risks loosing its key differentiation factor with its main competition Dropbox – of being a no-nonsense, secure, enterprise oriented service. 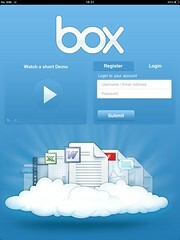 Box.net, the big challenger to DropBox for a cloud-based storage solution, has introduced Box OneCloud. This is a set of four ‘premium’ Box-enabled enterprise apps (plus thirty others) that allow document editing, annotating, note taking and faxes, from within Box. Today, we’re pleased to answer that question with the introduction of Box OneCloud—the first enterprise mobile framework to bring together your mobile content and the mission-critical apps designed to work with it. Starting with over thirty iOS apps, including four premier apps that offer deeper “round-trip” integrations, OneCloud will help you be productive from anywhere. Read more at Box OneCloud: Powering the Mobile Enterprise in the Post-PC Era | The Box Blog. This infographic, shared by Wikibon, highlights the changing role of the CIO. A top priority for CIOs today is supporting business transformation through the application of cloud, mobile and big data. Think of the CIO as managing a portfolio of applications, technologies, people and processes. The technology portfolio is allocated to initiatives that are designed to 1) Run the business 2) Grow the business and 3) Transform the business. Like a good portfolio manager, the CIO must balance risk and reward by allocating resources in a balanced manner. There are several other nuggets of information available on this infographic, including the fact that cloud adopters save an average of 21% annually. via The Changing Role of the CIO [Infographic] « Wikibon Blog. A cloud computing firm, Numecent, has demonstrated cloud based games. Their technology, called ‘cloud paging‘, allows users to stream any application to their PCs. Unlike competing technologies, this technology runs the application at the user end, instead of on a server. It works by analysing the code of a piece of software to discover the most-used elements and only delivering those to your PC. For large applications such as Photoshop, users normally only need around 5 per cent of the code to start using the program and the rest can be streamed in later. This ability to remotely provide any application, on-demand, takes us one step closer towards the concept of utility computing. via One Per Cent: Cloud-streamed games let you click and play. Box.net is giving away another 50gb free to its existing and new users. This coincides with their launch of the Box for Android app, which introduces bulk upload, commenting and collaboration features. To get this free upgrade, users have to access their Box.net account from an Android device. A note – iOS users who availed of the free 50gb offer last year cannot use this offer to get a 100gb account. Read more at Android Users Get 50GB FREE. Get Your #Box50GB and Enter the Box Mobile Giveaway | The Box Blog and Bonjour! Box for Android Adds New Collaboration Features and a 50GB Upgrade to Boost Productivity | The Box Blog. CSC has released an infographic that showcases the drivers and business impacts of cloud adoption. CSC’s survey found that enhanced mobility is the key driver for firms to adopt cloud computing and that firms benefit from small savings and increased IT performance. Read more at How Has Cloud Computing Impacted Businesses Around the World? [INFOGRAPHIC].